Yoo and Dancers. Photo courtesy of Yoo and Dancers. 92nd Street Y, New York, New York. Humans have always wanted to fly. Dancers, for their part, learn to reach leap, reach and battement in a defiance of gravity. Might that idea of flight – and its contrast in grounding – be useful fodder for art? For Hee Ra Yoo, that idea is at least to be there for the interpreting. 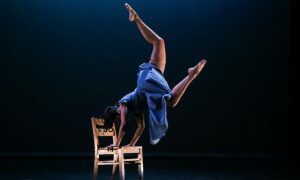 As an 2018-2019 AIR (Artist in Residence), Yoo showed four different pieces at the 92nd Street Y as part of the 2019 APAP Conference, all with a sense of flight and grounding – and intersecting ideas about memory, social power dynamics, community cohesion and more. The program describes how Yoo has international performing, teaching and choreographing credits, and founded the New York City-based modern dance company, Yoo and Dancers. 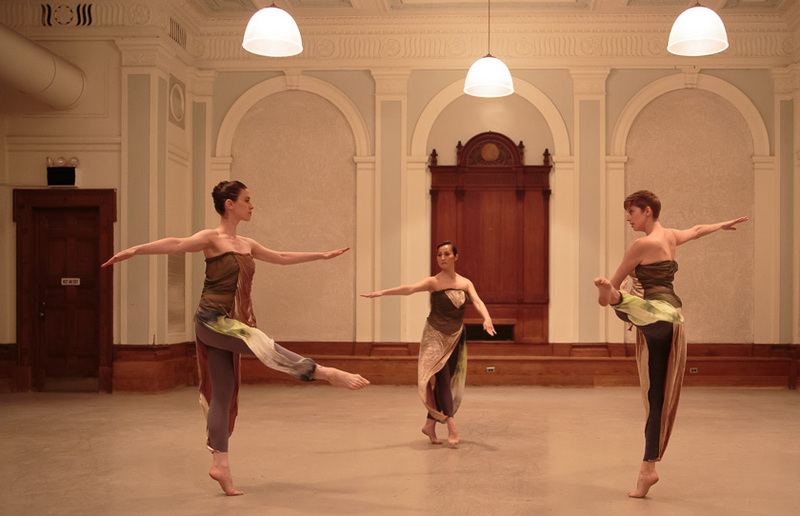 The first piece, 9 Movements, began with six dancers in a clump. With various chords in the music (Murcof, Utopia, edited by Yoo), they began to shift to the side, to the front and to the back – all in striking unison. This unity broke as they dispersed to different places on stage, in a few new clumps, at different levels. Those varied levels, together with differences in facial expressions and movement quality between the clumps, built a sense of power dynamics. 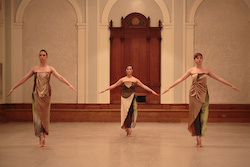 The movement also exhibited clear level changes in space, moving from a lunge through passé relevé, to repeat that with a pirouette. Other turns included battements, reinforcing that sense of lifted defiance of gravity – all with a counter-acting grounding in the body, however. Also compelling was a gestural quality matching the staccato notes in the music – a small, subtle and quick quality like that of a bird’s movements: in gaze, in isolations, in speed and size of movement. Perhaps this was coincidental, simply of interest and in the style of the choreographer, but perhaps this was a reinforcement of the idea of flight and grounding. 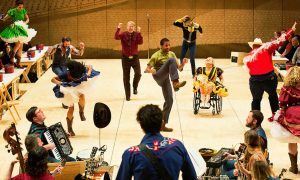 The movement picked up speed, along with the music, and began to find more play with momentum. The movement also became more “weighted”, more grounded into the floor – yet those lifts, in defiance of gravity, were still present. Even in this “play”, certain images were quite clear and precise. One particularly memorable one was with pairs of dancers executing battements in opposite directions (devant and derrière), while leaning into each other – thus making straight long lines in space. The dancers offered other compelling phrasework as the piece progressed, with command and conviction. Yet it’s interesting to think of what exploring a couple of other elements could have brought to the piece. One is venturing more often into levels in between very low and very high. As another, the dancers moved in a circle formation toward the end of the piece – something that could bring a pleasing, intriguing harmoniousness to other sections in the piece. Perhaps that exploration would not align with Yoo’s vision, perhaps that sense of flight and grounding – but interesting elements to consider nonetheless. 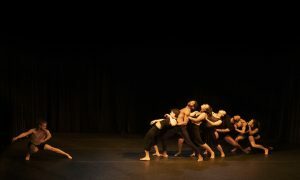 The work ended with dancers in that high level moving with power and confidence, high over another dancer closer to center stage, kneeling and curling into herself – resurrecting that sense of power dynamic. What seemed prescient here was the idea that high or low, discordant or harmonious, when individuals gather some will attempt to hold power over others, and some will acquiesce. The third piece, The solo, featured a soloist (Rebecca Walden) and a live pianist (Ben Weintraub). Walden began with a dreamy, passionate sense in her movement and overall demeanor – reminiscent of Lois Greenfield’s dance photography. Her white leotard and short white tutu (designed by Yoo), contrasting the shiny black piano, all evoked classical ballet with a neoclassical touch – polished, proper and high-class. Walden began to rise and fall, elbows and other joints initiating. Strikingly, an organic, silky-smooth sense of contemporary dance lay within the rather classical movement vocabulary. Walden offered all this movement with a lovely marriage of strength and easy softness. Amber lighting from a high diagonal, creating multiple shadows, added a sense of mystery to that quality of movement. She ventured away from the piano, yet a piece of her tutu remained. As she chainé turned away from the piano, the tutu unraveled. There was a feeling of her losing something but also gaining some kind of freedom. Yet, tethered to the piano she still was. Even so, it seemed she found power and further freedom soon enough, through a symbolism of flight. She wrapped ends of the tutu around her arms, spreading her wingspan wide, describing wings. She stood high en pointe, proud and assured – ready for flight, it felt like. She found more smooth yet classical movement in varied levels, and finally ended in low, grounded space. A sense of her soft strength, no matter how and where she stood in space, felt clear. Yet a desire to find flight remained. The work struck me as both aesthetically accomplished and full of poignant meaning. One element that might have added to both considerations is a greater range of speed, particularly slower speeds – evoking contemplation and adding further richness to the movement at hand. Two other pieces in the AIR presentation had similar themes. Silk Road was a trio evoking Yoo’s Korean cultural tradition and memory – with a sense of tension between remaining in that tradition and moving beyond it. Korean traditional music (Beyng-Ki Whang’s Silk Road) and dress (with patterning offering a more modern aesthetic, costuming by Yoo) helped create this theme in a very atmospheric, compelling way. Chea closed the night, a longer work than the others and with more dancers. Just as with 9 Movements, there was a clear sense of social dynamic but a more harmonious one. Contact improvisation-inspired movement and partnered lifts allowed for both grounding and a resisting of grounding (flight) – aligning with that overall theme in Yoo’s presentation. Although certainly with elements ripe for the refining and further exploring, Yoo managed to mold movement and supporting aesthetic elements to speak powerfully about that concept of grounding and the desire for flight, as well as several other meaningful ideas in human existence. The presentation illustrated how dance can portray the innately human in ways words sometimes can’t.